Pedestal wash hand basin with mixer tap. Fitted shower with shower attachment. Fitted seat. Tiled walls. Tiles floor. Radiator. Frosted glazed window to rear aspect. Low level w.c. Frosted glazed window to rear aspect. Part brick built, wooden and glazed construction. Space and plumbing for automatic washing machine. Windows to rear aspect. Power points. Part wooden and part glazed door leading to garden. 12’ x 10’4. Wooden frame double glazed window to front aspect. Radiator. Built-in wardrobes. Storage cupboard. Telephone point. Power points. 11’11 x 7’4. Wooden frame double glazed window to front aspect. Radiator. Built-in airing cupboard housing gas boiler and water cylinder. Wall mounted thermostat. Power points. 11’6 x 3’11 max. Power points. Front garden: Enclosed by wooden fencing and hedgerow. Driveway: Providing off road parking. Pathway leading to front entrance. Flower and shrubs borders. Remainder laid to lawn. Outside light. Side access to rear garden. Rear garden: Approximately 85 ft x 53 ft. A good size and well maintained. Enclosed by wooden fencing and hedgerow. Borders are well stocked with a variety of mature shrubs and small fruit trees. Mainly laid to lawn. Allotment area. Paved patio area. Wooden garden shed. Greenhouse. Wooden built summer house. Further two outbuildings. Disclaimer - Property reference 12693NW. The information displayed about this property comprises a property advertisement. Rightmove.co.uk makes no warranty as to the accuracy or completeness of the advertisement or any linked or associated information, and Rightmove has no control over the content. This property advertisement does not constitute property particulars. 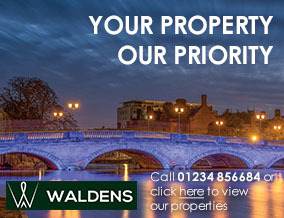 The information is provided and maintained by Waldens Estate Agents, Bedford. Please contact the selling agent or developer directly to obtain any information which may be available under the terms of The Energy Performance of Buildings (Certificates and Inspections) (England and Wales) Regulations 2007 or the Home Report if in relation to a residential property in Scotland.